Good People Brewing is only a few blocks from the Ronald McDonald House in downtown Birmingham. It is a community favorite for local brews and has always been a supporter of our mission. The primary reason that our house is located in its current location is to offer close proximity to the hospitals, but it is also nice to be close to so many great businesses and vibrant areas in town. As a part of the Parkside community, we have some amazing neighbors — Good People being just one. 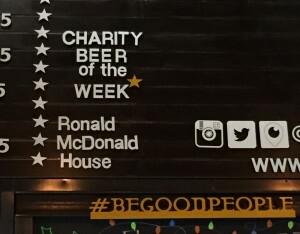 This month, Good People Brewing took our connection a step further with their “Charity Beer of the Week” fundraiser. For one week, for every Good People Pale brew that was purchased, Good People donated 10% of the proceeds to RMHCA. We have to admit this fundraiser was a little different for us, but it was so much fun! Many of our regular supporters headed over to Good People to support the House and enjoy some great refreshments while doing so. 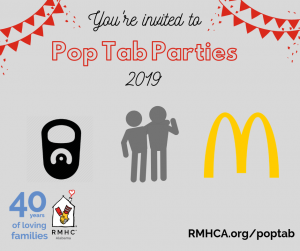 And RMHCA even had the opportunity to set up an informational table inside the brewery one night to create awareness among those who were not familiar with our mission. When we asked Lauren of Good People why they continue to give back in such big ways, she told us, “Everyone at the brewery has such a wide range of interests that we wanted this to be open to any and all non-profits that we could help.” Isn’t it great that Good People Brewing hires such Good People that want to give back!? Thank you to all those who had a GP Pale in honor of RMHCA. 🙂 There are so many ways to help out. This is just one example of how creative ideas can produce benefits for all involved.